From reaching over 6,000 activated delivery driver partners to launching its Full Day Option, Transportify Philippines has accomplished several milestones during the year of 2017. Below are some of the most significant achievements and plans for the coming 2018 to ensure that Transportify will continue to be the best courier in the Philippines. What are the things Transportify accomplished this year? After we launched our Business Program, more and more small-to-medium enterprises (SMEs) continue to hire Transportify as their third-party logistics (3PL) partner. Even bigger enterprises like furniture and appliances stores have enlisted Transportify’s courier and delivery services. This year, we assisted in delivering home appliances to Electrolux buyers during their 2017 Year-End Clearance Sale and established a partnership with Bayan Automotive Industries Corporation Philippines. Additionally, Transportify played a part in and contributed to the country’s business industry this year by joining TECHtonic 2017 and attending Seamless Philippines Expo 2017. Transportify Co-country Directors Noel Abelardo and Paulo Bengson also conducted seminars about using technology innovation to revolutionize business and logistics industries in the Philippines during the San Miguel Yamamura Packaging Corp.’s 2017 Innovations Day and Asia Logistics Summit 2017. During the Series A Funding Round of Transportify Philippines’ (Deliveree) fundraising event this October, the Southeast Asian logistics company secured a total of $14.5M from new and current investors. The funding was led by Gobi Partners and included other investors such as Inspire Ventures, Ardent Capital, PSA Unboxed, and Asia Summit Capital. The accomplished amount of funding serves as proof of the investors’ confidence on Transportify’s future, as well as an opportunity to improve Deliveree services all across Southeast Asia. Both the Transportify delivery mobile app and web app get an improvement with a new application dashboard. The dashboard improvement includes both User Interface and User Experience changes. The new look showcases an added menu on the header, a new booking system, and new ways to view the transaction and booking history. The new dashboard design aims to make the web and mobile app more convenient to use for all kinds of clients. Transportify Philippines’ heads are already foreseeing the business expansions that they will be doing to make use of the $14.5M funding they have earned. With the said funding, they are now even more confident to finalize business decisions. Clients can expect new addition of cities in Transportify’s service areas, and launching of more products and services. The logistics company is also aiming to reach out to more and bigger enterprises for business partnerships, both locally and internationally. As of press time, the on-demand delivery app hopes for the best as it welcomes 2018. Transportify cannot wait to reveal what it has in store for its clients and driver partners in the coming year! 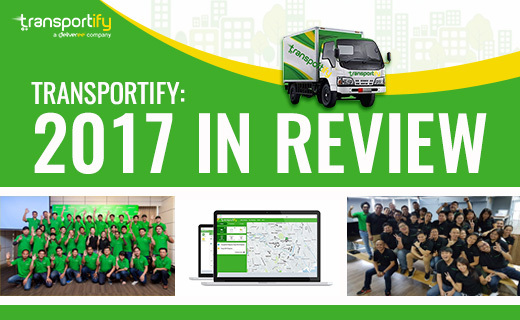 Transportify Philippines reviews 2017 and takes a look at its milestones such as the ways it helped local businesses grow, how it secured a $14.5M funding from its Series A Funding Round, as well as the new delivery mobile and website application. The on-demand delivery app also shared its plans for the coming 2018.